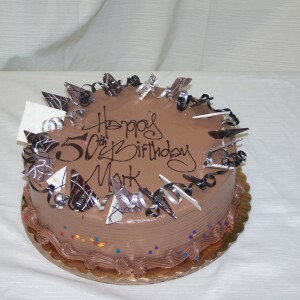 This Standard Cake design is available to order in limited flavors, for next day pick up. Shown as a half sheet cake with vanilla buttercream frosting with smooth finish on the side & ring of flowers in shades of pink with green leaves & chocolate adornments. With added duck design work. Also available in customer’s choice pastel flowers. This Standard Cake design is available to order in limited flavors, for next day pick up. Shown as a 16″ cake with vanilla buttercream frosting with combed finish on the side & ring of pink flowers with green leaves & chocolate dipped strawberries. Also available in customer’s choice pastel flowers. Specialty colors available with 4 days notice. 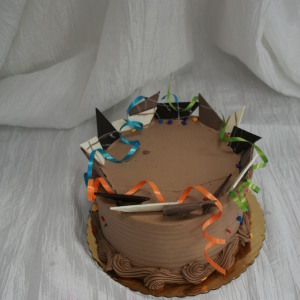 This Standard Cake design is available to order in limited flavors, for next day pick up. 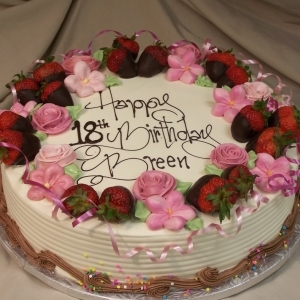 Shown as a Half sheet cake with vanilla buttercream frosting, ducks, flowers in pink & fresh strawberries. Also available in customer’s choice pastel flowers. 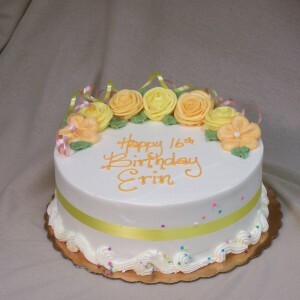 This Standard Cake design is available to order in limited flavors, for next day pick up. 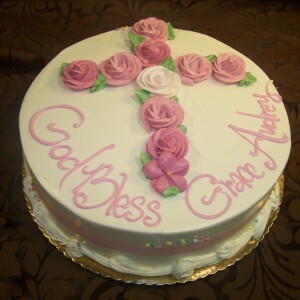 Shown as a 10″ cake with vanilla buttercream frosting with smooth finish on the side & flowers in shades of pink in a Cross Shape with green leaves. Also available in customer’s choice pastel flowers. Specialty colors available with 4 days notice. 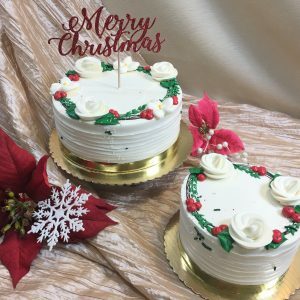 This Standard Cake design is available to order in limited flavors, for next day pick up. Shown as a half Sheet cake with vanilla buttercream frosting with smooth finish on the side & crescent of flowers in shades of Lavender & Pink with green leaves with a white decorative cross. Also available in customer’s choice pastel flowers. Specialty colors available with 4 days notice. 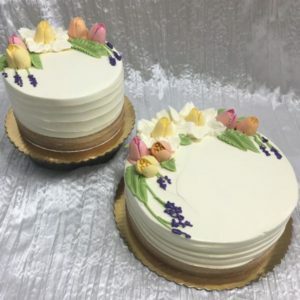 Seasonal Spring decoration available on any cake ordered in advance, features Vanilla buttercream frosting, Buttercream tulips, daffodils & purple grape hyacinth. Requires 7 days for all flavors, limited sizes & flavors available with 24 hours notice. This Standard Cake design is available to order in limited flavors, for next day pick up. Shown as a 8″ cake with vanilla buttercream frosting with smooth finish on the side & crescent of flowers in yellow & peach with green leaves. Also available in customer’s choice pastel flowers. Specialty colors available with 4 days notice. 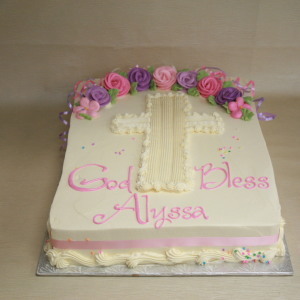 This Standard Cake design is available to order in limited flavors, for next day pick up. 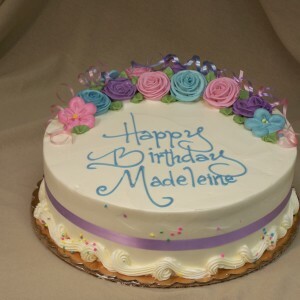 Shown as a 12″ cake with vanilla buttercream frosting with smooth finish on the side & crescent of flowers in pink, blue & lavender with green leaves. Also available in customer’s choice pastel flowers. Specialty colors available with 4 days notice.